Wow what a view! 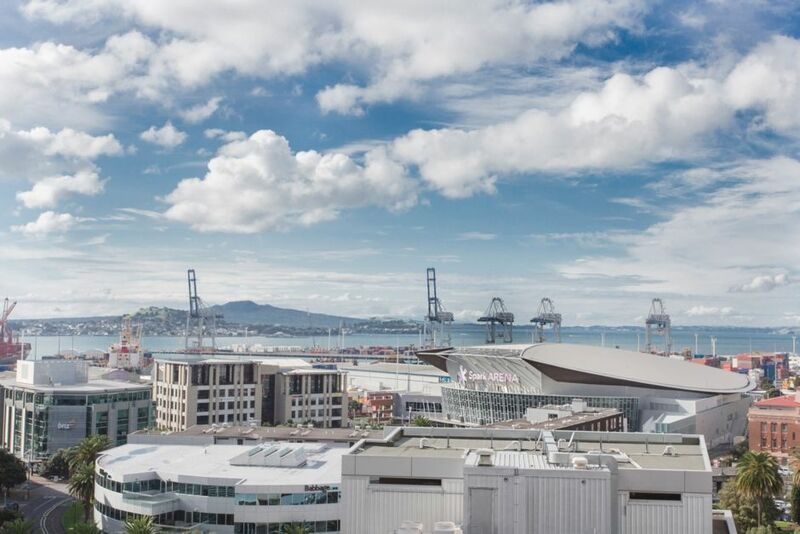 Feel like you are on top of the world in this two bedroom penthouse apartment has sweeping views of Auckland harbour. Heading to a concert at Spark Arena? If you are then you really can't get much closer than this, you can even see the venue right outside the window. Step outside and take a short stroll down the road to Britomart, Auckland's vibrant waterfront and of course the many designer boutiques, amazing eateries and the coolest bars that Auckland has to offer. There are two bedrooms, one with a massive king sized bed and the other with a comfy queen bed and views of the harbour. Wake up to the sun shining in the large windows, it really is a beautiful place to spend the night. Both beds are pocket sprung for your comfort and we use only the best high quality and professionally laundered linens to ensure you are well rested for the next day. Sit back and relax in the large open plan living area with wonderful high stud ceilings that really make you feel as though you are on top of the city. Enjoy the large LED Smart TV with Netflix, bluetooth audio system, free unlimited Wifi, board games and toys for the kids during your stay here. There is a double fold out sofa bed (futon) in the lounge as well as a roll away single bed for extra sleeping space. There are also original artworks by local artist Chuck Gordo that liven up the space and make sure that it is not just another boring old apartment. The large kitchen and open plan living are ideal for entertaining or hanging out with friends and family, some of our guests say that they really just don't want to leave the apartment once they arrive! There is coffee, tea, sugar, milk, cooking basics and we always leave you some tasty snacks to enjoy. You get a car park for use during your stay which is a rare thing in the city and will make accessing the apartment a breeze (no charge for this). We have additional parking should you have more than one car (subject to availability) for $20 per night and this must be booked in advance. Lost keys incur $150 replacement cost plus any locksmith costs. We have a strict no party policy. No pets, no smoking, $1000 fine if breached. Damage to large artworks by Chuck Gordo will be at the cost to guest - full replacement $4000. Enjoy the apartment and everything that Auckland has to offer! Amazing view, free car park, funky interior, quality linen, unlimited WiFi and free Netflix! All of this in a great location in central Auckland. Great location for main attractions in Auckland. We really enjoyed our stay. The property was clean and well appointed and close to everything in town. We would definitely stay here again on our next Auckland visit. Nice clean, modern, well situated apartment for guests visiting Auckland. Good location, good instructions and information, well thought out for the guests. Lots of extras in details, convenience items and information. The apartment is very nice, open & cozy. Great for couples and families. The washing machine kept prematurely draining and thus stop the agitation of clothing. 1 small air conditioning unit, so the apartment can get a little warm in the summer. Overall we enjoyed our stay and would recommend this apartment and location to other travelers. We are very pleased you enjoyed your stay with us. We would be happy to welcome you again if you come back to Auckland. Emilie and the team at Towny Apartments. Apartment was wonderful- we had loads of space! Location was great- close for walking or public transport. We had a car, so having a parking spot was also great to have with this property! Hello Katherine, Thank you for staying with us. We are happy that you enjoyed the apartment - we would be delighted to host you again next time you visit. Thanks again. Kind regards, Emilie. Hello Stacey, Thank you for staying with us. We hope you enjoyed the apartment - we would be delighted to host you again next time you visit. Thanks again. Kind regards, The team at Towny.